Don't worry if you can't pronounce the name of this museum, we couldn't either. We liken this to many previous experiences we had that go something like this. Little town has some memorabilia relating either to somewhat famous people in the town or to the history of the town. 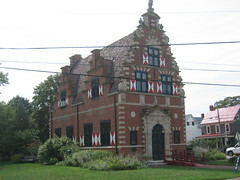 Little town also had an historic building that became available or receives funding to create a museum. Little Town creates museum, which is frequented by an eclectic group of people with extra time on their hands. Now we are in no way disparaging this practice or this museum. Heck, we love when Little Towns do this, we go out of our way to find these. So The "Z" museum as I'll call it, was no exception. A somewhat interesting exhibit on horseshoe crabs and the early inhabitants of the area dominated the downstairs. The upstairs had two interesting exhibits. 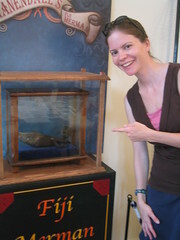 One was of shipwreck findings, but our favorite was an actual fiji merman from the old Barnum gag. These relics are not easy to come by (we've seen one in Tombstone, AZ and one in Seattle, WA). Don't be fooled there are imposters (in fact we were told there was one down the road in Fenwick Island, DE), but this is the real live thing. The docent gave us the old joke asking us why we think it's enclosed in two cases. Answer: Because otherwise he would get out at night. Duh!